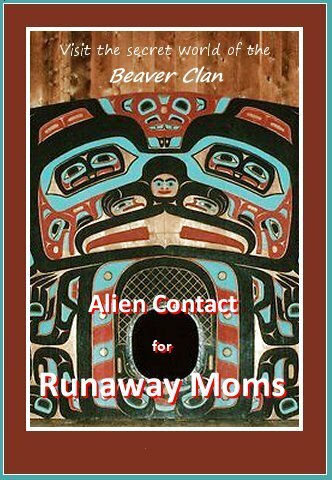 In the near future, a duplicate of Vancouver Island has appeared off Washington State, inhabited by Kwadrans — Native Americans from a scientifically advanced alternate Earth. Matt Verhailey has engaged the help of Kwadran Duchess Opsie Beaverpaw in finding his niece, who has fled her abusive lover to Kwadra’s forbidden underground cities with her seven-month-old daughter. Last week, the search party was ambushed when Larry set off his implant’s pheromones, causing a flurry of unexpected desire between Bligh, a young woman, and the rest of search party. Today’s snippet continues from there. She matched actions to her words, bending so deeply that her hair trailed the ground. If the duchess hadn’t held his arm in a bear hug, he would’ve taken the girl’s hand to pull her up. But if he touched her nubile young flesh, ripe for loving, would he have been able to stop at standing her up? They both smirked at Larry. When Pete kissed her, she responded enthusiastically. Opsie chuckled and looked up at Matt. He met her gaze. I hope you enjoy the bonus in today’s snippet: a travel poster. When you read a book, you travel to another world, right? This poster encourages you to visit the world of AC for Runaway Moms. Does it make you want to take the trip? I really like the graphic, too. Is this derived from your cover? I’m glad you like the travel poster. None of it will be on the cover; I think that a mother and baby will be a bigger sales draw than aboriginal art. But I’m trying something different with this book: illustrations! This will be inside the book, along with some other pictures. You’ll never know… A lady never tells. LOL Nicely done, Ed. I thought it was the *gentleman* who never kissed and told. I love it when I come up with a catchy title. Believe me, it does NOT always happen. As ever, always make me smile with your excerpts. She won’t tell. A smile is high praise indeed. Thanks! love the ending. “You’ll never know.” leaves a lot to the imagination as to what could have been and what is coming. Gotta keep ’em guessing, ya know.